The Hood River Valley Eagle Swimmers defeated the Gladstone Gladiators tonight at the Hood River Aquatic Center. The girls took top honors with a 129-36 win and the boys score was 70-25. Double winners tonight included Sarah Arpag (100 fly and 100 back), David Hecksel (100 fly and 100 back), Mario Jaimez Villa (200 free and 100 breast), Faith Ocheskey (50 free and 100 free) and Luke Southall (50 free and 100 free). Other event winners included Celilo Brun (100 breast), and Alea McCarty (400 free). Scoring in that 2nd place position were Celilo (200 IM), Chloe Bullock (50 free), a double for Adam Burke (200 IM and 400 free), Jessica Galvez (100 back), Madaket Greenleaf (100 fly), Abby McCormack (100 breast), Olivia Sumerfield (200 free and 400 free) and Owen Summersett (50 free and 100 free). Scoring in 3rd place included Campbell Keller (200 IM and 100 breast) and Sarah Wang (100 back). And team finishers also scoring individual points towards the win included Miyuki Gerald (4th 100 fly), Joshua Humann (4th 50 free), Teddy Parkinson (4th in 200 free and 4th in 100 free). 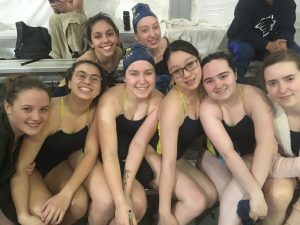 JV swimmers showing great improvement this week included Lourdes Chamorro, Laura Gontijo, Madeleine Jones, Mary Rose Kissinger, Abi Loihl, Claire Powell, Grace Skakel, Ellen Sova and Gigi Ziada. The Eagle swimmers showed great prowess by winning all the relays that were competed this evening as well. 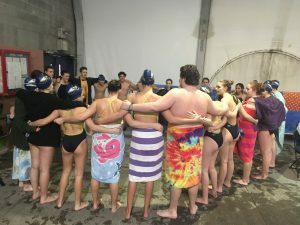 Next up, Hood River hosts Intermountain Conference competition the Redmond Panthers on January 24th at 4pm at the Hood River Aquatic Center.